The Motley Fool Canada » Bank Stocks » Should Investors Be Concerned About Canada’s Big Bank Stocks? Should Investors Be Concerned About Canada’s Big Bank Stocks? There’s been some concern lately surrounding higher interest rates and their impact on mortgage generation and credit losses. And while those claims aren’t unfounded, the issues shouldn’t come as much of a surprise either. After all, when we’re constantly hearing about consumer debt levels being the highest they’ve ever been, then it’s clear that a rising interest rate will only have a negative impact on that. Does that mean it’s time to sell bank stocks? Investors that purchase bank stocks are usually in it for the long haul and so selling in a period where things might be a little more challenging for the economy is not something I’d say is a good move. 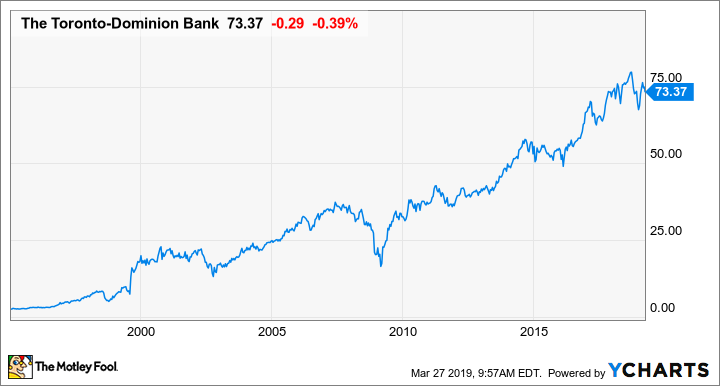 Even during the most dire of times, in 2008, when investors were generally bearish on bank stocks, especially south of the border, Toronto-Dominion Bank (TSX:TD)(NYSE:TD) ended up recovering rather quickly from the fall in price that took place during that time. The trajectory of the stock has remained strong over the years, and while there will be dips in the economy, it’s still one of the safest investment to hold. TD and other bank stocks will continue to rise as long as the economy performs well. Even if mortgages are down or credit losses are up, there will be plenty of new businesses opening every year and more consumers opening accounts. Just relying on population growth alone will help ensure that a stock like TD will continue to find ways to grow its business. Ultimately, the economy is still doing well and for TD to be a sell, I’d have to think that the economy is on the verge of a significant depression, not just a recession, to think that it’s a good time to sell bank stocks. For speculators and short-term investors, there will be different drivers that might make them prone to sell, but long-term investors are likely better off to just stay the course. Bank stocks will not only appreciate in value over the long term, but investors will also benefit from a growing dividend as well. And by selling shares that you may have owned for years, you’ll be losing that benefit and will have to invest even more money just to get the same payout again. In the case of TD, the stock currently pays investors a quarterly dividend of $0.74, which equates to a dividend yield of a little more than 4%. It’s not a bad payout, but the real advantage is in holding the stock for a long period of time. Five years ago, the stock was paying investors just $0.47, meaning that it has risen by 57% during that time for a compounded annual growth rate of 9.5%. Holding on to your shares and seeing your dividend payments grow means you’re effectively earning a higher dividend yield on your original investment. Selling those shares would effectively reset that and you’d be back at earning 4% if you decided to re-invest. Unless you have a very limited investing window, there’s little reason to consider TD or other big bank stocks today.